In 1966, I worked one summer with an upperclassman from Princeton at a camp for rich kids. (That’s where I learned to cuss.) His family was friends with other New Englanders who had known the Kennedys, and JFK had only been dead less than three years. So the JFK halo was still very bright. He told me that JFK “exuded leadership” (a phrase I’ve never forgotten), and that he could just walk into a room, shake hands, and then, walking out, every man would follow him. He was suave, self-assured, and magnetic. And he was a war hero. He was tested. Or so the biographies would say. 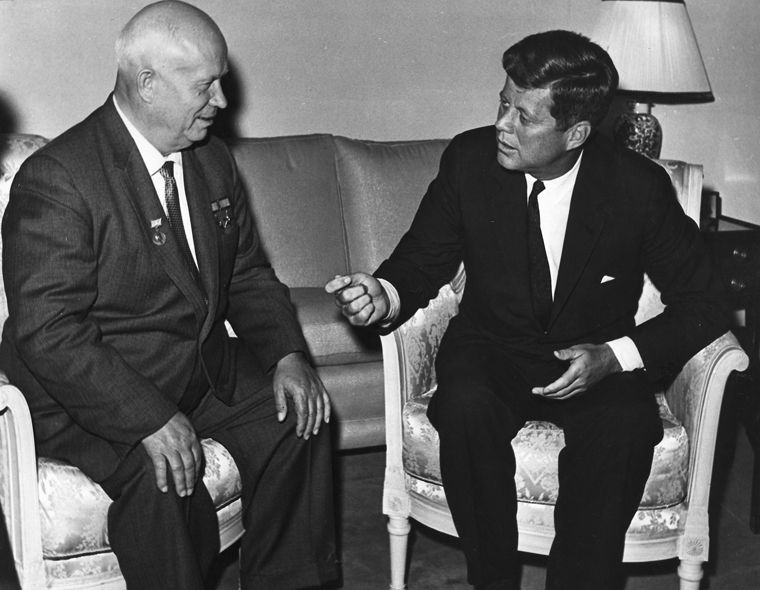 It would be many years later before I would run into the unreported story about JFK’s first summit meeting with Khrushchev in June 1961, right after he took office. There were several serious issues on the table: U-2, Berlin, nukes, Cuba, and Southeast Asia. Press reports said JFK and Khrushchev had meaningful discussions, and at the time hailed it as a triumph…only The Berlin Wall was built 90 days later, proving all those claims false. It would be in the 1970s, when the myth began to fade, that I learned that Khrushchev had mugged Kennedy in those meetings. In fact, it was privately reported that after one session JFK was so wobbly he had to be helped from the room. No really, his words, and I wrote all this down in the morning before I saw the press reports of the mugging Barack Obama took at the hands of Vladimir Putin at the United Nations. Now the difference between Obama and JFK, on the manhood-ometer, really, has never been in question anyway. But JFK’s ability to admit his failing speaks volumes about his integrity, a skill for which Barack Obama clearly does not possess. And he also had a second go at Nikita with the Cuban missile crisis, which proves he also learned and grew stronger from the episode. JFK no longer believed being president was a lark. Obama failed that test only just this week for the umpteenth time. But instead of wandering off into mental self-congress about how effeminate, cowardly, or self-delusional Barack Obama might be, consider the shock the next president of the United States will have when confronting a Vladimir Putin who might erroneously think he can now kick America around and must be shown otherwise. For the current GOP candidates, you can’t simply wrap this question into a nice tight little policy statement, for this has nothing to do with policy or diplomacy, but what one will do when the Russian guy tries to continue his game of roulette, by walking out, or leans over and whispers in your ear, “We’ll bury you.” Obama has placed the presidency in such a sad state that even facing down the President of Mexico could be a hard slog for his successor. When asked about Putin, Donald Trump said “I can talk to him!” But what if Putin won’t let him? Reagan proved at Reykjavik that he was a superior negotiator, and he did it behind closed doors, allowing Gorbachev to save face. Still he returned to Moscow with wobbly legs. Trump is a master of these kinds of negotiations and never goes to the table without knowing his full arsenal of options. Among the candidates he stands at the top of the list on this account. But does he fully understand these stakes are more than a simple win-lose in real estate? It was JFK’s cavalier attitude that led him into a trap with Khrushchev in Vienna in 1961. It’s crucial that Trump lets the voters know he understands the difference. Who else? Well, despite that luminaries such as Glenn Beck say he’s “not ready,” Dr Ben Carson has held countless lives in his hands in many life-and-death situations, and hasn’t won them all. He also knows the agony of defeat. Can “Corporate Carly” do the gut-check? I’m less confident. How about Marco, who’s already been rolled?… by a pack of mediocre US senators, the likes of John McCain and Lindsay Graham? Like the block of cheese in the Cheez-It commercials, I really do believe Marco is not ready. Take the JFK scenario of 1961 or the Obama scenario of this week, and measure each of the candidates just on the gut-check aspect of leadership. Besides Trump and Carson, I’d add Ted Cruz, who’s walked through fire before, as well as Scott Walker and Rick Perry, both no longer candidates, but both of whom have also walked through fire. I think Jeb Bush would man up. About the rest I’m either not sure or dead certain they’d fold like a cheap suit. Previous Article Is the Church Returning to the Practice of Political Trade-Offs?